Fire Safety Rocks: Coming Soon! If you live in or around Clarksville, we hope you can come to the 11th Annual Fire Safety Awareness Parade and Kidsfest Safety Fair﻿ on October 5th! Momma holds these events dear to her heart. She came up with the idea for these two events after attending a class at the National Fire Academy﻿. With the help of Fred Taylor, the Johnson County Fire Chief's Association and other organizations and people in the community, these events came to life! Each year, many volunteers help with the safety parade and safety fair! The purpose of the two events are to raise awareness about safety to children and their families and to share with children that firefighters and other emergency personnel are their friends and community helpers. Momma is especially honored to have been asked to be the Parade Marshal this year at the Fire Safety Awareness Parade. I get to be a Parade Marshal too! So exciting! 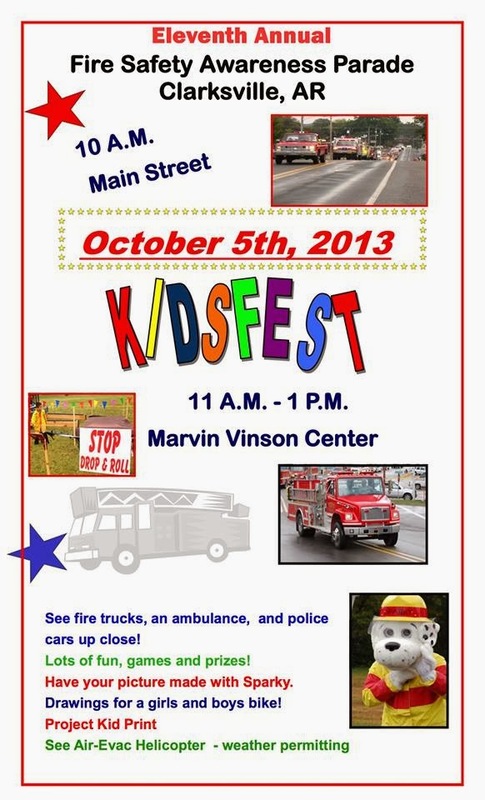 I will also be at the KidsFest Safety Fair shaking paws with everyone and sharing fire safety. Woof!